Perfect fit and great value with the pre-filter. If you've the Honda engine (160) that this pair fits it's the best price here at Jack's. Packaged as a combo the pre-filter foam that fits in the cover, and the main pleated filter over the carb. Both my 25T splitter & walk behind mower Cub Cadets gets this treatment. The filters are as OEM. You'll spend upwards of $19 separately in the outdoor power section of the stores. Buy great quality at fair prices shipped here at JSE. 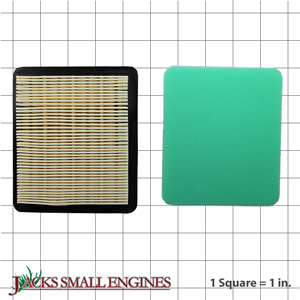 Ask us about the Stens 102713 Air Filter Combo. Please no repair questions. Your Q&A may be posted to Jackssmallengines.com to help other shoppers, like you, with their purchasing decisions. Thank you.